I'm new to backpacking & getting ready for my first overnight. I have watched all the "how to pack your pack" videos I can find but I can't seem to load my gear so that my pack doesn't sway from side to side. I am trying to put the heaviest weight in the middle of the pack & close to my back. I was fitted for my pack at REI. I'm 5'3", have a short torso & have an XS female-specific Gregory Deva pack. I tighten all of the straps to cinch in the contents. I always have side to side movement when I walk. The weight of the pack fully loaded except for water is right at 20 lbs. Any suggestions about what else I can do? Thanks! The center of gravity of our packs (where the heaviest items are) should be close to our bodies' center of gravity. Maybe just slightly above. For us women, our center of gravity is quite a bit lower than that of most men. It's just below our waist, due to our larger hips. Therefore the heaviest items should be barely above waist level. They also should be closest to our backs so they don't pull away from our bodies. Most directions for loading packs are evidently designed by/for men, whose center of gravity is well above the waist, near the shoulders. That's why those directions aren't working for you--you are not a man! You need to put the heavier items lower, so you won't be thrown off balance. Don't pack heavier items high, as often suggested. You may also have a pack fit problem--pack fit is almost as individual as shoe fit, so a pack that others recommend may not suit your body at all, especially when loaded. That's why we recommend buying the pack last, and taking your gear with you to the store. I personally have found that increasingly, REI employees don't know that much about backpacking. Unless you know a long-time employee by reputation, don't rely on their expertise--most don't have much. However, start out with the cheapest solution: pack the heavier items low, close to your waist and close to your back, and see if that makes a difference. I think it will! I get that when the load lifters are not cinched up. They should pull pack into your body. If they are loose, they sit on a fulcrum attached at waist strap and swing back and forth. The great news is REI is supposed to have great customer service. Load the pack up and go into the store during non-busy hours. Get them to help you adjust the pack. If you can't get it to fit, return it and get something that fits your body better. Packs are like shoes... just because they are a good brand and the right size does not mean they will comfortably fit you and your body. Don't try to make the wrong pack work... get one that does work. You don’t say how much sway you get. Are you just getting a little sway side to side,because the load lifters create about a finger of space between your shoulder and shoulder strap? Or is it serious movement,throwing you off balance at every step and twisting the waist belt? A slight amount of movement is unavoidable,with emphasis on “slight” - just enough to avoid straight jacket fit. Take all your gear with you when you go back to REI, and have them help you pack. If they can’t get the pack to work, ask for a refund and go to a local store (Dicks and Cabela’s don’t count.) Talk to staff until you’re confident they can fit you properly. If they’re not willing to fit the pack with your actual gear, you’ve got the wrong store. You could sway sideways naturally when you walk. 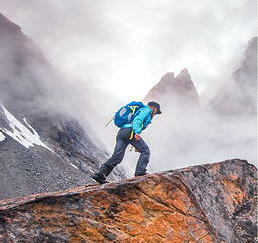 A pack will amplify any natural gait. I see a lot of people walking and viewed from the back, they sway. You may have to learn to walk without swaying. Trekking poles may also help you minimize a natural tendency to sway. Thank you all! I'll try placing most of the weight lower and see if that helps. If that doesn't help, I'll take everything with me to REI (it's 2.5 hours away) the next chance I get. I appreciate everyone's input! Do try the other suggestions, too, especially the one about tightening the load lifters. I didn't think about that one--I have such pressure-sensitive shoulders that I have to make sure the load lifters keep the top of the shoulder straps from more than barely touching the tops of my shoulders! So I didn't even think about the consequences of loose load lifter straps! I ran afoul of those male oriented pack loading directions early on, back in the 1980s, so that's why my recommendation was to try that first. I still see those even today! Certainly that's the easiest place to start! (Sigh.) one more thing we men are to blame for! The worst part, though, is that you’re right. They’re also not designed for young boys. Or even all men. Then I have the person put the pack on, and adjust the straps (and recheck the torso length and shoulder strap wrap), tightening the load lifters and sternum last. Then, man or woman or kid, I ask if the pack feels like it’s pulling them backwards, and where the pull feels like it’s coming from. Depending on the answer, we start moving things around and sometimes re-shaping it (put the food in a tall, narrow stuff sack or in two sacks) and then put it back on to see how the fit changed. Eventually, we get it dialed in. That seems to work better than the one-way-fits-all diagrams we all are familiar with.